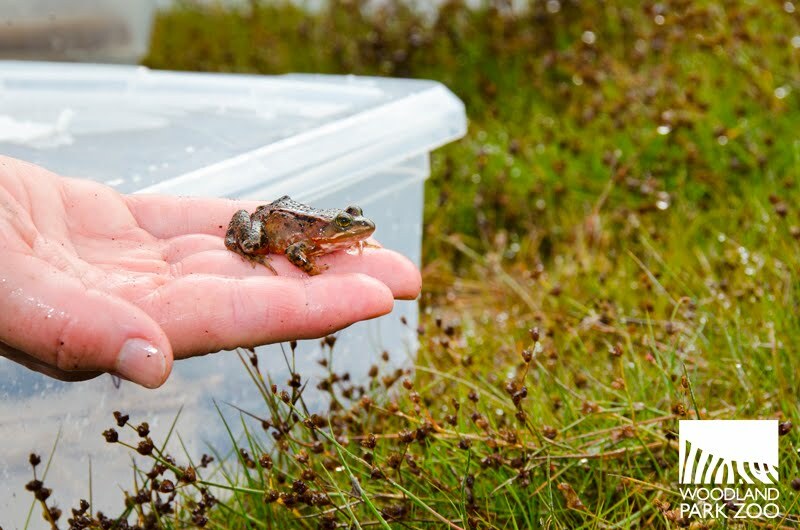 More than 1,000 endangered frogs started their journey back into the Washington wild yesterday. Populations of the native Oregon spotted frog have been decimated by 80 to 90 percent in our own backyard. 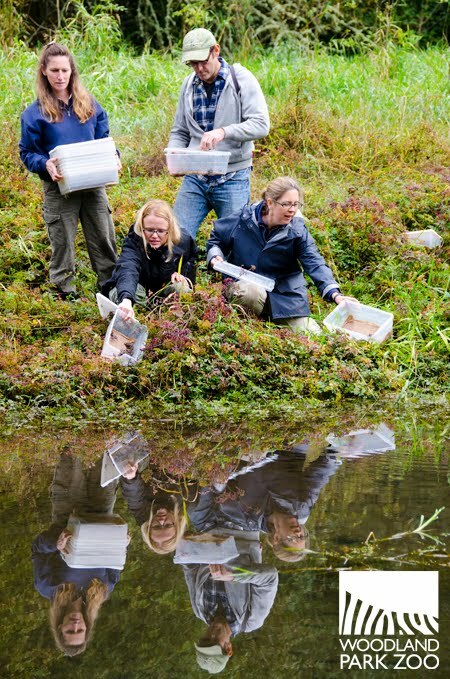 But thanks to a multi-institutional recovery project, nearly 1,200 frogs were released yesterday into the wild at a protected site to help restore their populations in Washington state. 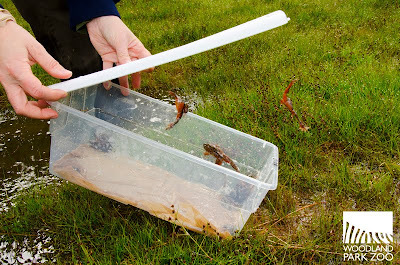 These frogs start their lives as eggs collected from wetlands by Washington Department of Fish and Wildlife biologists. The biologists send the eggs to us and other rearing facilities including Northwest Trek Wildlife Park, Oregon Zoo, and Cedar Creek Corrections Center. Our role is to hatch and rear these frogs to give them a safe, predator-free home during those crucial first months when they transform from tadpole to full fledged frog. 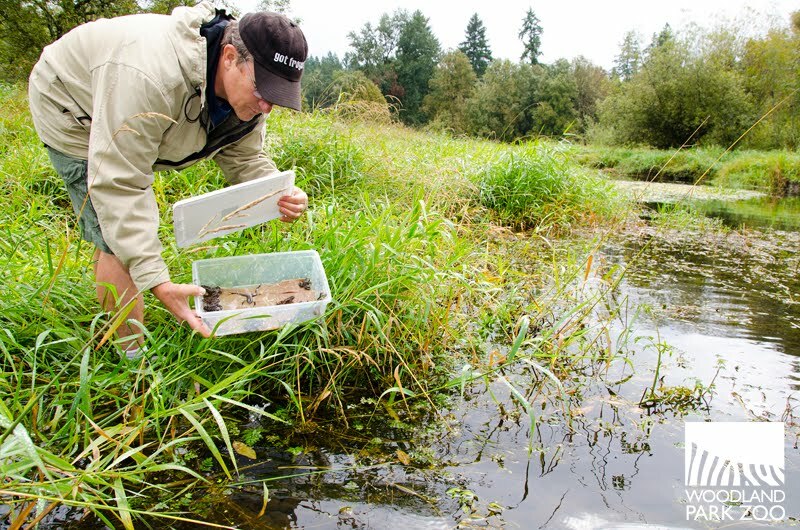 Once the frogs are big enough to survive out there on their own, they are ready to be released to a protected lake site at Fort Lewis through a partnership with Joint Base Lewis-McChord. 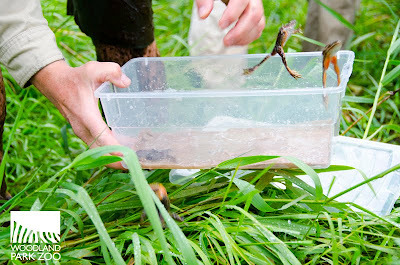 That’s where these frogs took their leap into the wild yesterday. 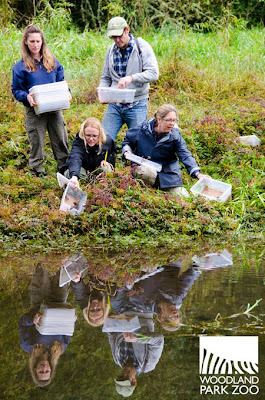 The release of this batch of frogs is especially exciting for us because these frogs represent the next generation since the recovery project began in 2007. 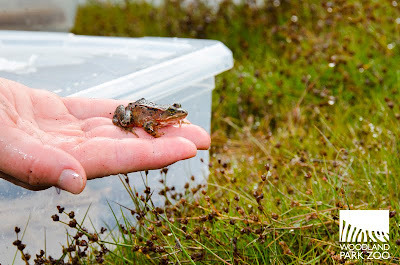 They are the first frogs to come from eggs collected at the wild release site, which means frogs we’ve released in previous years have been thriving and are now successfully breeding! Washington declared the Oregon spotted frog an endangered species in 1997. It historically ranged from southwestern British Columbia to northeastern California. However, scientists have seen populations plummet, driving the frog toward extinction. The native amphibian has lost ground to habitat loss from draining and development, disease and the introduction of invasive species such as the American bullfrog. The Oregon spotted frog is now known only in Klickitat and Thurston Counties in Washington state. - Be kind to our shared habitat. Reduce pollutants by eliminating chemical pesticides from your gardening practices, or help with efforts to improve the quality of local wildlife habitat by joining a habitat restoration program in your community. - Please always take care not to release unwanted pets or animals into wild habitat—invasive species can outcompete or prey on native frogs. Call your local animal shelter to find a new home for an unwanted pet. 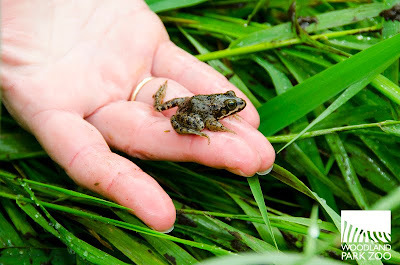 - And of course, your support of Woodland Park Zoo makes native Oregon spotted frog recovery possible. Thank you!